ESG Investing Returns - Do Sustainability Leaders’ Stocks Outperform? ESG Investing Returns – Do Sustainability Leaders’ Stocks Outperform? 24 Jan ESG Investing Returns – Do Sustainability Leaders’ Stocks Outperform? Motivated by our response to FT Alphaville’s recent “Lies, damned lies and ESG rating methodologies” article – wherein we advocate for the merits of both ESG ratings and socially responsible investing – we conducted a benchmarking study of our 2018 sustainability award winners financial performance and returns. Could we provide another data-based anecdote that helps answer the “Do sustainability leaders and their stocks outperform?” question? 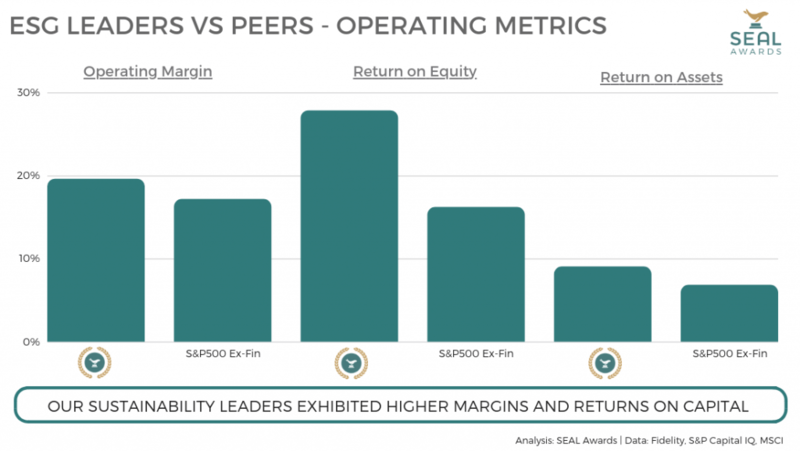 To briefly summarize our own methodology, we compared a range of financial operating performance, governance, and shareholder returns data of our 2018 SEAL Business Sustainability Award Winners – a proxy for the “most sustainable companies in the world” – against all non-financial S&P 500 constituents. Our data was sourced via Fidelity, S&P CapitalIQ, and MSCI. Sustainability leaders will often have deep moats, with high ROICs, strong management & governance with a long-term vision, able to retain top talent – sounds like a good screen for compounders. Sustainability laggards are often fighting fires, reactive and just trying to survive. Sustainability leaders have their sh*t together. 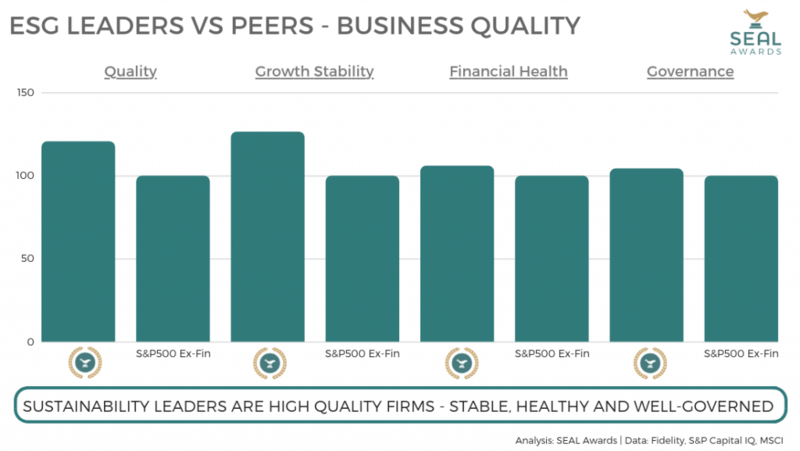 Using S&P Capital IQ’s qualitative scores, this appears to be the case: Sustainability leaders are high-quality firms – stable, healthy, and well-governed. Consider this another data-driven anecdote in favor of a shift to more socially responsible investing. The S&P500 Excluding Financial Sector consisted of 470 companies. The metrics presented for the 2018 SEAL Business Sustainability Award winners reflect all 27 winners that are S&P500 components. 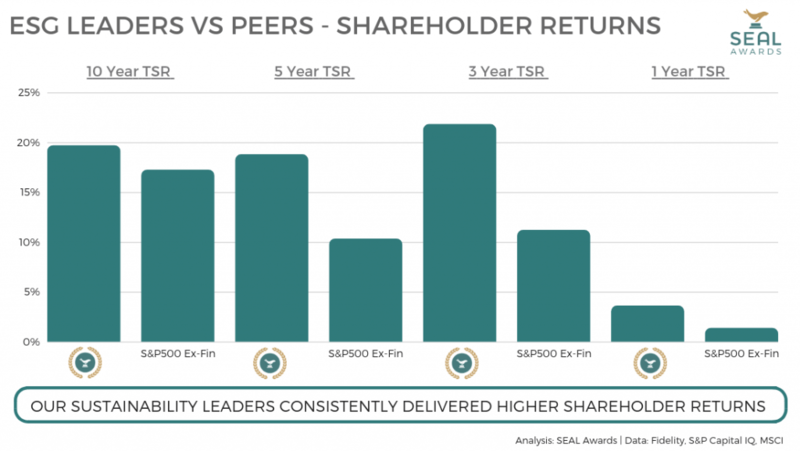 As a result of this study focusing on S&P500 components, a number of international 2018 SEAL Business Sustainability Award winners – like Adidas, BMW, Kering, LG, and Samsung – and leading private companies – like Patagonia – are not included in our “ESG Leaders” basket. Data was collected as of December 12, 2018.